Just because Lent is over doesn't mean it's time to stop eating fish. In fact, you’ll probably want to ramp up your intake, or at least you will after reading this list of the 11 best places for fried fish in Chicago. They don’t call ‘em the Great Lakes for nothing. 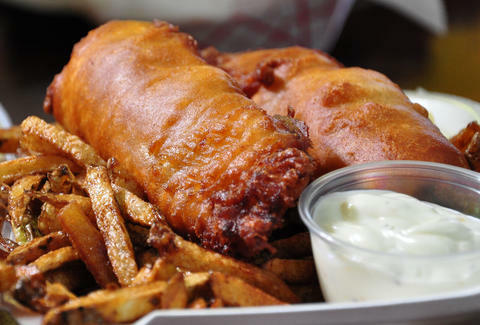 Known for enormous portions, the fish & chips entrée at BIG & little’s keeps it simple with everything you need from a local fried fish outing, including heaping servings of beer-battered fried cod, fries, lemons, and tartar sauce. The expert move here, though, is to bring someone with you and go splitsies on the fish & chips AND the equally massive soft shell crab po’ boy. This modern taco shop, by way of Dallas, specializes in taking the classic tastes of popular non-Mexican eats and putting those flavors into house-made tortillas. 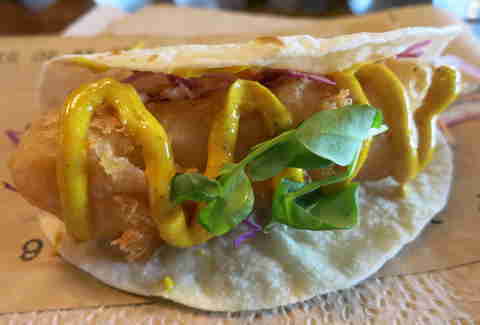 One of the best representations on the menu is the Fish n' Chips Taco, where a perfectly fried piece of beer-battered cod gets topped with a well-paired curry mayo and some malted fries hidden inside. This neighborhood favorite on Pulaski plays host to a cult following on Fridays, largely because that's when it serves one of the city's best-bang-for-your-buck bar meals: an all-you-can-eat fish and chips plate. 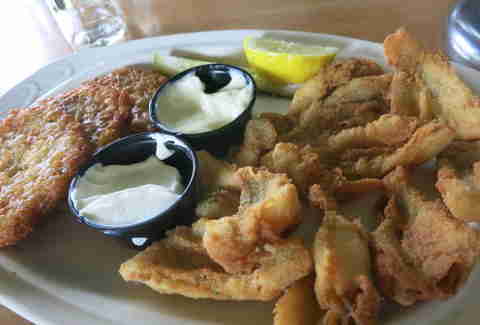 Beer-battered cod is fried throughout the evening as regulars put down plateful after plateful. For best results, enjoy yours with an always accurately poured Guinness. For all those times you're jonesing for a fish sandwich with a slightly more Vietnamese-y flavor profile, head over to Argyle St and the famous Ba Le. The Cod banh mi features Corona-battered and fried-to-order fish, and it’s served like all of the other classic banh mi. 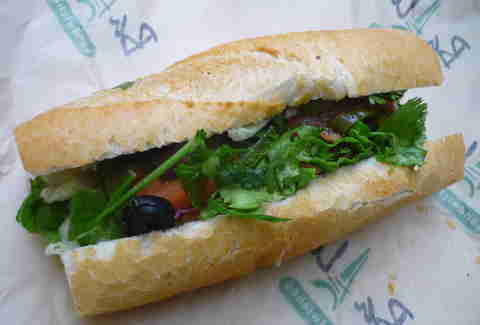 Crumbly bread with crunchy jalapeños and crispy fish in between? Um, yes please. The catfish sandwich from this Southern-fried chicken spot is a sleeper hit. With a large filet lightly dusted in cornmeal and fried ‘til both juicy and flaky on the inside, what's supposed to be a sandwich can easily be eaten as a dinner. You're supplied with a bun and all the necessary toppings on the side and then you can decide how you want to tackle it, plus the whole thing is paired with some excellent, fresh-cut fries. This neighborhood gastropub had an under-the-radar opening, but has gained a loyal set of regulars since, with a cozy rustic setting matched by a fantastic beer list, plus cocktails for those who prefer the hard stuff (hi). The food menu features seasonal farm-to-table fare with a standout fish & chips option -- ale-battered Atlantic cod is served with fresh-cut fries and house-made jalapeño tartar sauce and malt vinegar. Don't mind if we do. Spring means smelt season in the Great Lakes region and Troha's typically has them on its menu. It's been like that since day one (which was in 1917!). Don't let the name of these little fishies fool you: they take on a mild fish flavor and can be popped like French fries. Guaranteed you can't eat just one... plate. To experience a true Midwest-style Friday Fish Fry, you need to head out to the far corners of the city. Located near the Indiana border in a residential neighborhood, Steve’s serves a classic fish fry each Friday, attracting locals who've been coming forever. The option of fish native to the Great Lakes makes it an even more authentic experience. The cheap beers and colorful corner tavern characters don't hurt either. This longtime Lincoln Ave favorite made its triumphant return after a long remodeling and the food is as good as ever. 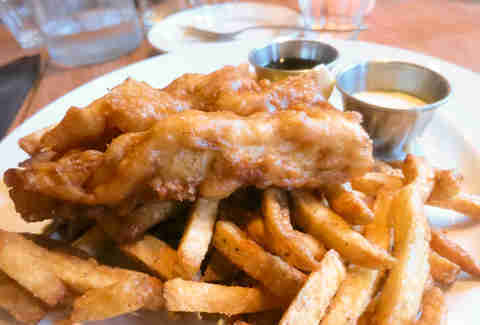 Try the English-style fish & chips, which features three nicely fried filets of ale-battered cod sitting atop a beautiful pile of fresh-cut fries. Pro tip: have them the proper English way with curry powder dusted on top. After a long day dodging flashing bulbs amidst the tourist hordes at Millennium Park, some quality upscale pub food is just what the doctor ordered (if the doctor likes to get boozy). 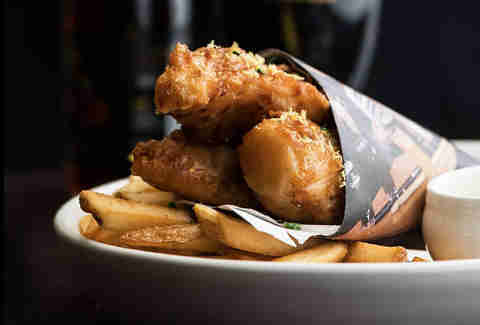 This popular gastropub does a terrific fish & chips option using a combo beer batter of Guinness and pilsner, which results in an extra crunchy outside. Enjoy them while overlooking the park. Each Friday you can try the fish fry box, which comes with catfish nuggets sitting atop the signature frites (which are topped with all kinds of craziness every other day of the week). The whole thing gets stepped up a notch with homemade tartar sauce and killer house pickles. It may not be as crazy as some of the other options, but it's still crazy good.